Glass tube level indicator made of 1.4571 (AISI316Ti) - Borosilicate and quartz glass, mica, sealing, level gauges, armature - Continental Trade. Glass tube level indicator for operating pressures up to 25 bar. Made of high Quality stainless steel 1.4571 (AISI316Ti) with flange or male threaded connection. For visual observation of fluid levels in vessels, boilers and silos. 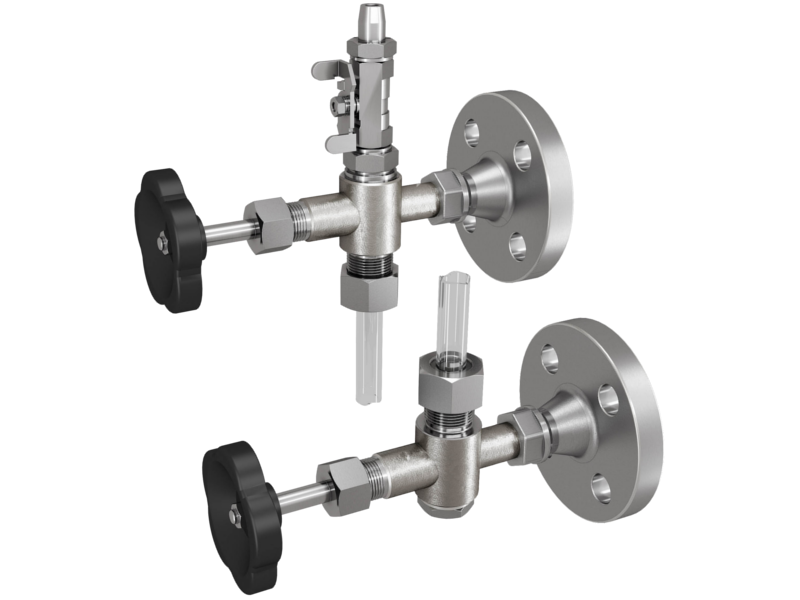 The ACI filling level indicator Type 460 consists of two connection fittings that are joined by a thin glass tube. Type 460 is suitable for installation outside of a tank and shows the liquid level inside the container directly through the principle of the communicating pipes. For better visibility of the liquid level, especially for clear, colourless liquids, a float ball can be added that moves up and down inside the glass pipe with the liquid level. Type 460 can be supplied in a free choice of length with flange of screw connections. For a distance between the connection fittings of more than 1500 mm, the whole length is divided into several sections that are connected by means of of intermediate supports. Inside the connection fittings, a packing seal made of EPDM or PTFE ensures a secure seal. In case of dirt or damage, the filling level indicator can be separated safely from the monitored container by means of the stop valves integrated into the connections and emptied in a controlled manner. Owing to the delicate glass pipe, Type 460 is supplied not mounted. The installation connections must lie exactly on a line, especially for the model with flange connection, and must not be turned against each other so that the glass pipe is not subject to tension after installation in the fitting. An impact protection casing made of Plexiglas is available for Type 460, which protects the delicate glass pipe during operation from external damage. Contact our competent team to find the perfect solution for you! depending on the glass and gasket selection.